This is a very simple git workflow. It (and variants) is in use by many people. I settled on it after using it very effectively at Athena. GitHub does something similar; Zach Holman mentioned it in this talk. Update: Woah, thanks for all the attention. Didn't expect this simple rant to get popular. # go ahead, make changes now. # keep abreast of other changes, to your feature branch or master. # rebasing keeps our code working, merging easy, and history clean. #           you might do this many times as you develop. # optional: feel free to rebase within your feature branch at will. #           ok to rebase after pushing if your team can handle it! # merge when done developing. No DO or DON'T is sacred. You'll obviously run into exceptions, and develop your own way of doing things. However, these are guidelines I've found useful. DO keep master in working order. 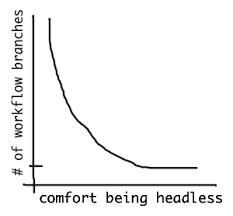 DO rebase your feature branches. DON'T merge in broken code. DON'T commit onto master directly. DON'T hotfix onto master! use a feature branch. DON'T merge with conflicts. handle conflicts upon rebasing. Won't git merge --no-ff generate merge bubbles? Yes. Merge bubbles aren't inherently bad. They allow you to revert entire features at a time. They get confusing and annoying to deal with if they cross (commits interleave), so don't do that. What do you mean by "incremental, atomic" changes? Thanks wikipedia, I couldn't have put it better myself. Why not gitflow or another complex workflow? Be my guest. I've used gitflow and other similar models. After working in various teams, this is just what I've come to use. But next time you have to ask someone whether it is okay to push or pull from this or that branch, remember my face. Friends claim more complex models are necessary for scaling large teams, maintaining old releases, controlling information flow, etc. It very well may be that using multiple mainlines (e.g. develop, stable, release, v2, tested, etc) is exactly what fits your organization's constraints. That's for you to decide, not me (unless we work together -- oh hi there!). But you always have to wonder, "shouldn't I use tags for that"? For example, tracking releases on a branch is a bit silly. A release commit can be tagged. You can checkout a tag, just like any branch, or any commit, and do whatever it is you need to do. So, perhaps taking five minutes to teach your team how to use checkout and tag might save you more than 15% on car insurance. Don't fork. Push feature branches to main repo. Sometimes I see people forking repositories in order to issue pull-requests. Yes, you may have to do this when contributing to open-source projects you don't regularly contribute to. But, if you are a contributor, or working in the same org, get push rights on the repo and push all your feature branches to it. Issue pull requests from one branch to another within the same repo. Should I merge Pull Requests on the site or commandline? Up to you. Github does git merge --no-ff so that the commit message indicates the pull request number. This is useful information to have, don't just throw away history for the sake of it. You never know what will be useful to look at in the future. One small addition: if you share a feature branch with someone else (because you're working together), don't rebase the pushed branch. You can rebase locally but once it's pushed don't rebase until the very end when it's ready to merge. To help that final rebase, think of annotating your commits with "squashme onto ..." indications. It's about time this got popular. Our team has been using this method for years. Reflow automatically creates the pull request against master from your feature branch and ensures that it gets a code review. There's no need for it to be more complicated than this. git config --global alias.ru "remote update"
git config --global alias.cam "commit -a -m"
git config --global alias.staged "diff --cached"
git config --global alias.both "diff HEAD"
git config --global alias.oneline "log --oneline"
git config --global alias.amend "commit --amend"
git config --global alias.undo "reset --hard HEAD^"
git config --global alias.tree "log --graph --decorate --pretty=oneline --abbrev-commit --all"
Say you have this workflow, and have 2 servers: live and staging. Of course, staging tends to be ahead with new features that you (or your client) don't want to release yet, but a critical bug appears on live. What do you do? If you have a branch for each one of the servers, you just need to commit in there (or fork and merge) and deploy. Done. You can still fork from a old tag, true, but it makes the history a real mess. See also: sane branch handling - always set up your pushed branches as 'tracking' branches and have them use rebase. @pyriku: If you need to put a bugfix on the live server, you can create a branch off of the tag you've made and then commit the bugfix. If that's what you meant by "you can still fork from a old tag", then I don't know what you mean by it making history a real mess -- you end up with the same situation you had before, you just made the branch at a different point in time. @jbenet: Could you elaborate on the reasoning behind the "Don't Fork" point? What are the pros and cons of the two approaches? We ended up with almost exactly the same workflow in our team, though we're using Gitlab for repo management. Feature branches, and merge requests in Gitlab facilitating code review (no-self-merge rule). The only change as that our master branch is always being deployed into "training" (staging) environment, and we're doing releases once every three weeks - branching them off master on the release day, for later hotfixes etc. @jbenet how come "Don't fork. Push feature branches to main repo." Well done. Thanks for posting this. we work like you at frostwire, never needed to use the "rebase" command (still have no clue what it is for), we just make sure that the feature branches have merged all the changes of the master if the master has kept moving forward, then when you merge the feature into the master you only see the changes, we hardly ever deal with conflicts. @nicotaing i use this workflow and on feature branches i frequently rebase, reset and force push all the time. those "donts" you just listed aren't really "donts". if nobody else is using my feature branch its no business of yours how often i force push. when there's collaboration on a feature branch it gets more interesting, and then you have to negotiate resets and rebases and force pushes with your collaborators... but, someone just needs to grab the global write lock on the branch (no this isn't a git feature -- use hipchat or whatever) before force pushing then. you failed to read the comment in this article which mentioned explicitly: "ok to rebase after pushing if your team can handle it!" if there's too many commits on a branch and rebases turn into a mess, i'll also sometimes use git reset and use a single commit or reduce the number of commits by squashing all the "oops, typo" commits and then rebase the reset branch and force push it all. i've got a branch i need to merge later today that has 50 commits in it, and i'll probably squash those down to about 5 before rebasing and submitting a PR for the branch (most of the commits are bumping a Gemfile.lock repeatedly to test various upstream changes). This simple model appeals to me. I presented it to my team, and a question came up. What's the best way to handle the situation when there are two feature branches that we want to deploy to our test server that aren't in master yet? Often feature branches will touch the same files so there will certainly be merge conflicts. Any ideas, besides trying to merge one feature branch into the other (which requires some communication, etc)? Woah, thanks for the attention! Didn't expect this rant to get popular. That's probably safest. But I find when working with few others who are OK with rebasing, it can help keep things clean. @fhawkinsozer thanks! some very useful aliases there. Be careful though, overusing aliases can hide away what git is really doing underneath, and potentially confuse your team members. I like magic and shortcuts as much as the next guy, but i've learned magic tends to force more communication. # edit, commit, and merge into master as usual. #   for your team. The real cost is communication/organization overhead. Yeah! precisely. :) If you'd like me to add some of this to this gist, send me a diff. Could you elaborate on the reasoning behind the "Don't Fork" point? What are the pros and cons of the two approaches? Sure: forks add significant management complexity. For example, the fork owner has to make sure all changes from the mainline are pulled to his master. This can easily get out of sync as the developer's interest in the project waxes and wanes. It's best if there is just one mainline to worry about. Also, other users may seek fixes/experimental branches that haven't been merged yet. It's much easier to find those as branches in the same repo (particularly if they haven't been PRed yet) than explore the fork network, particularly when -- as a newcommer to a project -- it's very unclear what forks/devs are important to watch. @rileytg see above. Happy to expand if you want more reasons? I will say, if you don't trust your junior devs not to push onto another's branch (destroying code), or not to merge things into master (doing all sorts of bad things), you might want to re-teach your junior devs (or exchange them for new ones). Trust your team. Make it clear what is right and isn't right to do, but trust them. and we're doing releases once every three weeks - branching them off master on the release day, for later hotfixes etc. Check out the comments to @pyriku above. You might find it easier to do this with tags. If it's easier with a branch for you, keep it up! @nicotaing thanks! I think it's ok to rebase collaborative branch, iff the other devs are comfortable. It can work really well to fix stupid mistakes. @gubatron learn rebase. it will change your life. What's the best way to handle the situation when there are two feature branches that we want to deploy to our test server that aren't in master yet? It's worth noting that I'm wary of why the problem is coming up in the first place. While it's not uncommon to have two feature branches that depend on each other, wanting to test them together, not sequentially, can mean trouble. What if problems are emerging (or hiding) due to the interaction of the two feature sets? It's harder to reason about two sets of changin-and-potentially-broken code interacting together than it is to reason about only one. Of course, I don't know your constraints, no rule works always, and exceptions will emerge. But always worth stepping back and wondering whether there is a simpler way. I imagine by tag-based builds, you mean builds on a specific release tag. Worth mentioning you can use a rolling tag (i.e. test). Picking between branches or tags depends on what your team is more comfortable with. Updating tags requires -f, as it is not the main use case for tags. FWIW, in your case, I'd probably use branches too. Is there anyway to give people push access without giving them the ability to accept pull-request? What if a junior developer not familiar with git accidentally pushes a toxic master branch? Forking gives each developer a sandbox. @amccloud I don't think there is. This would be nice to be able to do; but finding the right UX to avoid an access control headache is non trivial. I prefer keep master branch clean with current release, think about users going to github repo and viewing a README that is not of the current release. Instead I use a develop branch, a part that I use the same workflow. @amccloud gitolite allows you to mark any branch as "protected", so that only people with the appropriate permissions can push to it. This allows anyone to play with the feature branches (and maybe deploy them into staging sandbox), but then go through the review process with a more senior person to get the code sanity checked and merged. Gitlab (based on gitolite) puts a nice Github-like web interface on top of that - allowing people to create merge requests from their feature branches, and stopping them from merging their changes into master if they don't have write access to it. @fibo cool! One point to note is that master should be release-ready at any time. One should be able to take master and expect it to work. For example, when using continuous-deployment, you don't have voluntary releases. As soon as the codebase passes the test suites, it is automatically deployed. Many webapp dev teams operate this way. So if the last release is many commits ago -- and the readme is now radically different -- perhaps try releasing more often :). In my experience, this flow without the rebasing works well. The problem with rebasing is that you're rewriting history. 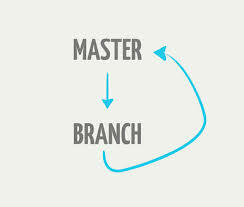 If you have a merge conflict between what master has become and your branch that conflict resolution is lost into one (or worse, many) commits in your rebased branch. This means that if you did this merge wrong, well, you're going to have to hunt it down. A regular merge keeps the conflict resolution in the merge commit itself. It's easy to see if something went wrong there. Rebasing also makes conflict resolution more cumbersome. You must resolve conflicts every commit instead of at the end. This means that if you may have to resolve conflicts in the same file multiple times without the context of what you did in your branch later on in the history. It makes those more error prone and more tedious. This obviously exacerbates the issue I mentioned in my previous point. I've also had absolutely no problem bisecting with gnarly "branch bubbles". Yes, it's a little hard to read, but I don't often need to read it, and when I do, I can figure it out. In short, it's less work and less dangerous to not rebase before merging, and the only benefit I've actually seen from rebasing before merging is a nicer looking history. That said, I do rebase often, but typically it's -i and on my previous base simply to clean up commits before pushing. No back merges. See my model on Dymitruk.com. You need more to make release candidate and see how things fit along the way with an integration branch. Small question though, if you use Early Pull Requests to discuss subjects, how would you easily rebase a branch since it has already been pushed to Github ? We're not using github, but a bare git workflow and trying to implement this, but we have an issue with wanting bug fixes from master in our feature branches and then after rebase and merge not have it appear in the history of the feature branch or generate any nasty merge conflicts. Could this be done? @zimbatm I have been using Git's autosquash feature for automatically annotating commits that need to be squashed into the original commit. Here is a really good blogpost on it: http://chrismar035.com/2013/04/04/better-pull-requests-with-autosquash/. The author of that blogpost has also published a demo video: http://asciinema.org/a/3467. Can you please explain how to revert a feature branch merge, fix issues on it and remerge on master ? The images are gone. The first image (flow) was taken from Zach Holman talk. I don't remember what are the remaining images (headless, merge bubbles). Does anyone know where to find them and restore this post? Found this on one on pandawhale. In the future, feel free to email me, as gist comments do not notify me. Use GitUp when you are ready to merge into master and push to origin. GitUp will run BranchUp before merging into master. Why secret? Now it can't be found through a search. Lots of rebasing on top of origin/master. Where is the mention of git rerere? Without that, you will be fighting the same merge conflicts over and over again every time you type git rebase origin/master. Without that people with long-lived feature branches and lots of refactoring being pushed to 'master' are going to hate you. Yeah, it would be great if this wasn't secret. Also what I'm missing is that if you rebase your feature branch that you should push --force it to origin because otherwise things go fairly wrong for me.